You've never seen a lure like the BOOYAH Prank. A lipped popper, the Prank can be worked on top as a popper that spits water thanks to a cupped and shaved mouth. 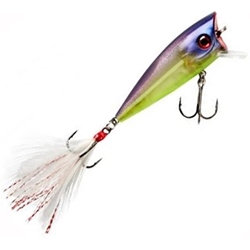 But it also doubles as a shallow-running crankbait where the shaved back helps impart a serious swimming action. A feather-dressed treble adds the final touch to entice strikes.